It's always such a treat when we get to meet up with our couples before their engagement sessions (or weddings!) 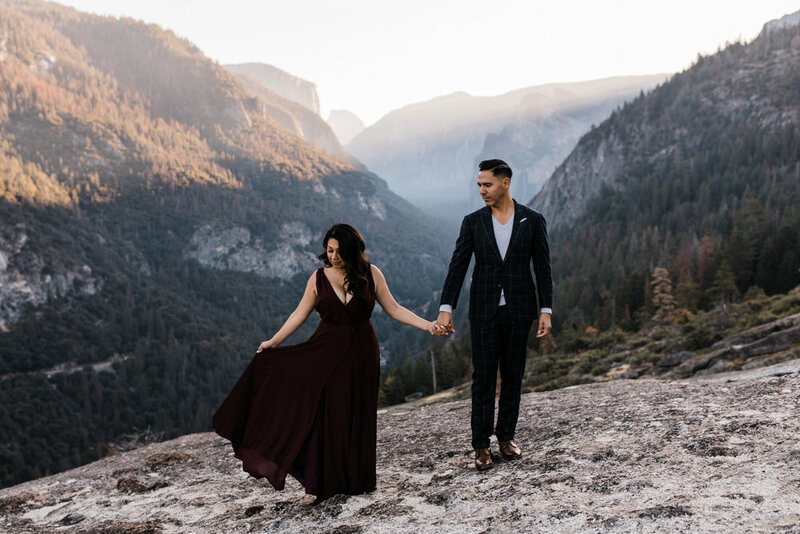 so when Ray + Ema invited us to dinner in Yosemite the night before their sunrise session, we were so excited! We met up with them at a quaint little bar tucked below Yosemite Falls and quickly realized we were going to be great friends. After a second round of drinks and hours of awesome conversations, we reluctantly said goodbye but weren't too sad knowing we'd get to see eachother again bright and early the following morning. These two were engaged in Yosemite, and even joked they got engaged because of our photos! Apparently our posts were so amazing, Ray decided he needed to lock it down so they could join us for an adventure as soon as possible ;) We had so much fun running around the slabs with them taking in the valley views at sunrise and then heading down to the banks of the Merced when the sun got a little higher. It was a super chilly morning and we were surprised to find a good amount of frost in the meadow that made for some super rad photos. 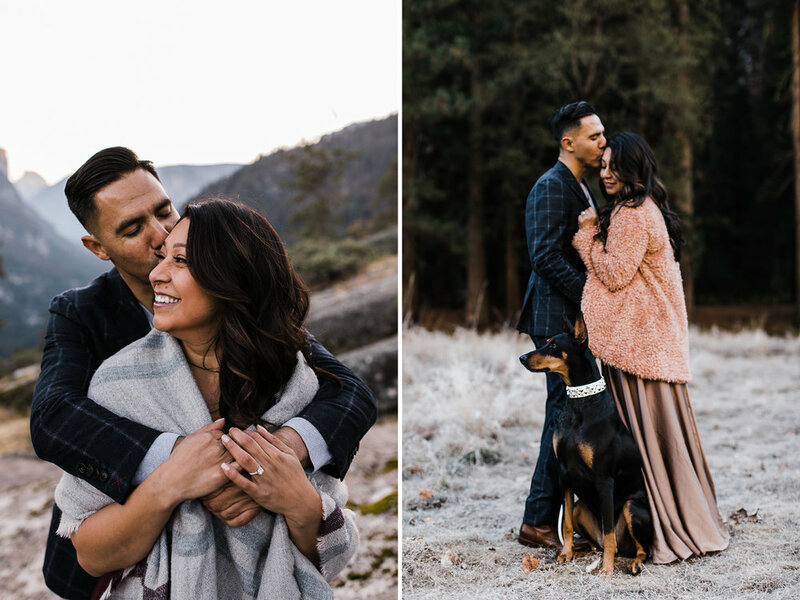 We joked that their November engagement session was nestled right between Fall and Winter as the meadow was frosty and the forest floors were covered in fresh yellow leaves. I'd be remiss if I didn't mention their sweet Dobie, Pepper, who most definitely stole the show. They looked like rockstars strolling through the valley with her! We had so much fun with them and were truly sad when the session ended, but already have plans to hang out again in Moab next year...they've promised to bring us beer and Chick Fil A, so yeah I think we're best friends now ;) This was our last Yosemite session of the year and it was truly a perfect way to end the amazing season. We are so stoked to have met these two and can't wait to see what the future holds for them!